Members of Bo’ness and Carriden Band are set to appear in their old stomping ground for a performance this evening (Friday). The concert will feature a varied programme put together by Charlie Farren and takes place in Carriden Church. All proceeds will be split between the church and two Primary Scierosing Cholangitise research charities. The band’s Flugel player, Hayley Edmond, has been touched by the chronic liver disease, after her 15-year-old brother was recently diagnosed. The band hope their contribution will help to raise awareness of and help to fund research of the incurable illness. They haven’t performed at Carriden Church for a few years and they hope it will be a good event. 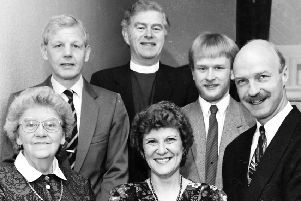 David Lapsley, secretary of Bo’ness and Carriden Band, said: “We originally just wanted to get back into the church. Over the years we used to put on a lot of concerts in there but due to circumstances we haven’t managed recently. He said when the members of the band heard about Hayley’s brother Scott, they knew they wanted to support him in some way. The concert is at 7.30pm in Carriden Church on Friday, February 26. Tickets cost £5 and can be purchased at the door.